The Convention for the Safeguarding of Intangible Cultural Heritage was the framework that favoured a world news. 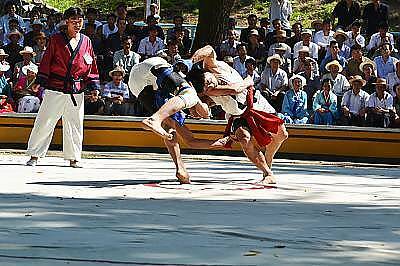 South and North Korea put aside their political differences in order to jointly present the nomination of ssirum/ssireum, traditional wrestling, to the Representative List of Intangible Cultural Heritage of Humanity. In 2013, South Korea submitted for inscription the making of kimchi, the fermented cabbage so characteristic of the local food. In 2015, North Korea nominated the preparation of kimchi to the same List and both proposals were adopted. In 2017, each Korea submitted separately the nomination of traditional wrestling to the List and UNESCO, by means of its Director General, Ms. Audrey Azoulay, initiated discrete talks with the two countries, in order to explore the possibility of integrating the two nominations, according to the spirit of the Organization and the Convention. After months of work, talks became fruitful and on November 26th Director General announced the submission of a joint application, which was adopted by acclamation by the members of the Intergovernmental Committee for the Safeguarding of Intangible Cultural Heritage and with the applauses of the about 400 observers attending the meeting. A number of nominations shared by two or more states are submitted each year, but nobody ignores the significance of this specific case, since it demonstrates that intangible cultural heritage (ICH) is a useful tool to promote reconciliation and collaboration between politically so distant states. In this way, ICH shows also its possible contribution to conflict prevention and resolution. Unfortunately, the same session of the Committee saw once more the misuse of ICH by Armenia and Azerbaijan, with the aim of reproducing their territorial dispute concerning Karabakh. However, this dispute makes clear that ICH can be used in the opposite sense, in a positive way, just as the two Koreas did. Only willingness is needed.